I didn’t grow up eating kale. It was one of those things like spinach that I just assumed was “ew, gross!” As I got older and discovered the yumminess of fresh kale and well, spinach, too, I have started eating a lot more of both vegetables. I call kale the super food. It is jam-packed with all of the good things you want in your diet. So what exactly makes kale such an awesome food? Fiber – Kale is full of fiber. This greatly aids with digestion. Antioxidants – Kale is jam-packed with carotenoids and flavonoids which are antioxidants that are known to be cancer-fighters. 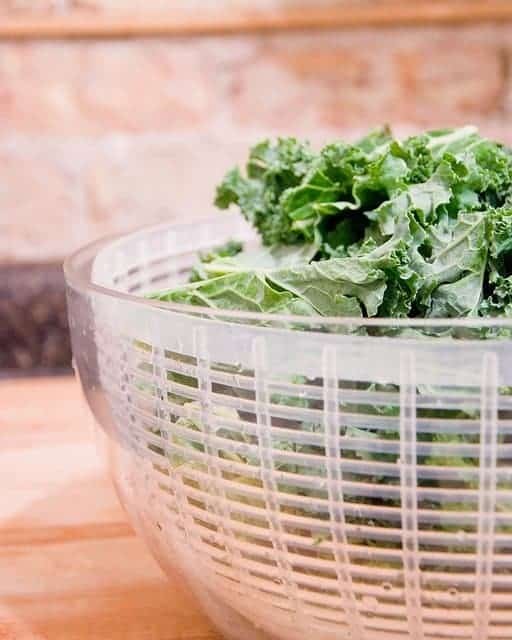 Vitamins – Vitamin K is the rock star vitamin of kale. Vitiamins A and C can also be found in kale. Kale is also a very good food to eat for lowering cholesterol. I like to buy as big bag of kale that has already been removed from the stems when I’m at the grocery store. It lasts for a good amount of time in the fridge and it makes using kale in recipes super easy. You can also buy bunches of kale and they are usually much cheaper than the big bags. So, now you know why kale is so good for you, but what should you do with it? There are lots of ways you can eat kale. Kale chips are easy and yummy. All you need to do is tear the kale from its stems after washing and drying. Place the torn kale on a baking sheet and drizzle with olive oil and your favorite seasonings. I like to use garlic salt. Bake it in a 350 degree oven for about 10 minutes. I like to add a handful of kale when I’m mixing up my banana blueberry smoothie. You can’t even tell it’s in there! You could do this with just about any smoothie. One of my all-time favorite soups is Sausage and Kale Italian Zuppa. It is beyond delicious. You can add kale to almost any soup, really. Kale goes great with pasta, too. This whole-wheat pasta with kale and fontina looks delicious! Do you eat kale? What are your favorite ways to prepare it?